Now I'm sorry I read it so fast. But what can you do? Diana Wynne Jones is definitely up there on my list of top ten favorite authors. She is so fun and quirky and surprising, and the older I get, the more I have come to appreciate those qualities in a book. Jones's latest has a complicated, gripping storyline and is touching, exciting, and hilarious (often simultaneously). Normally I'm a total stickler for reading series books in order, but I honestly think that it would be fine to start reading the Chrestomanci books with this one. Sure, there are recurring characters and references to past storylines, but the book definitely stands alone. The Chrestomanci books are more like a web of interlocking stories than a chronological series, anyway. What is the book about, you might ask? Where to start? Well, Joe's summer plans are ruined by his grandmother, who makes him take a job as a boot boy so that he can spy on the goings on at Chrestomanci castle. Marianne, Joe's sister, has her summer plans ruined as well, and she ends up at everyone's beck and call when she's not running all over town chasing her grandmother's cat, Nutjob, an escape artist extraordinaire. A magical family feud is brewing in the town, but when Marianne tries to tell her family what is happening, no one believes her. Then Cat, who lives up in the castle, becomes friends with Marianne, and she gives him the mysterious egg they discover in her grandmother's attic. 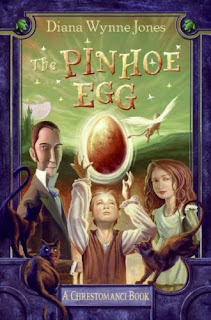 What hatches from that egg sparks the magical feud to drastic - and hilarious - proportions. It is hard to write very much without giving too much away. I loved the book, and I'm now in the unenviable position of having to wait for another one to come out. Oh, well. On the bright side, I found a new one by Zilpha Keatley Snyder today! Hi Darla, she has a new book out, called The Game - it's also great. Kind of reminiscent of Eight Days of Luke, if you've read that one. Thanks, rebekka - I saw the date on yours after I posted that and realized how long ago that had been! You'd think that, working in a library, I'd be more up on these things. I loved Eight Days of Luke - thanks for the tip - I'm looking forward to The Game. But not to having finished it, if you know what I mean! I know exactly what you mean! I read it in a day and was v annoyed it was over!